If you have been reading AA over the past few years you will know that BR knows sweet FA about tactics. This makes it difficult to judge the effectiveness of our full backs whose jobs change depending upon the formation. It was much easier to critique a performance in the days of Bob Mcnab and Pat Rice; things changed with the excellence and athleticism of Ashley Cole. So, full backs or wing backs? How did they perform last season? The first thing to say is that we improved once Mr Wenger tried the Back 3, the gaping holes in the defence disappeared but can the FB’s be blamed? You decide? Monreal: Dreadful start to the season. Unable to stop attacks down his flank which led to crosses and shots flying towards Petr. By season’s end he was back to being one of the best FB’s in the league but was he now a CB, a FB or a WB? Nacho has made over 150 appearances for Arsenal and as much as I like him I still hope AFC will sign a better defender. That said, one of my highlights of the season was the triple block of Costa’s shot in the FACF by Nacho, Holding and BFG. Real commitment. Monreal always gives 100%, is passionate, versatile, combative and this season scored a vital goal at Wembley. He signed a long-term contract in 2016, so I guess it will be Gibbs who is leaving. Gibbs: I hate to be critical of a proper Arsenal man but Gibbs hasn’t achieved his potential. A sparkling early career leading to England caps had me thinking he was the successor to Ashley. He isn’t. Good player for sure but we need better (and hopefully we have already signed him). Keiron started only 5 games last term, and 3 of those were at left wing back – a position he did well in and we certainly improved defensively with both Nacho and Keiron working in tandem. For his sake, he needs regular first team football and I expect Keiron to be sold in the summer. Bellerin: Fantastic player when fully fit and in form. Amongst the very best in his position as is indicated by the media hyping a move to Barca. Hector had his worst season in the shirt thanks to a series of injuries. IMO he returned too early to the first team which affected his performances and it was only at season’s end when we saw the real Bellerin – a player with tactical awareness, a superb tackler and the fastest player in the squad. Some awful haircuts this season as Hector attempted to be become a fashion icon. What is wrong with a short B & S? I expect him to leave in a couple of season’s but by then he will have won the CL and PL with Arsenal. Holding/Ox/Gabriel: In here as an addendum because they all filled Bellerin’s position during the season. Not did the job as well as Hector but nonetheless were not embarrassed . The Ox at RWB worked better than expected. Will we see the Back 3 experiment continue next season? And if so, where does Hector fit into the formation? Perhaps this is why there is so much media speculation, possibly activated by Bellerin’s agent. All in all, our FB’s did not give enough defensive support to their CB’s and this resulted in too many goals conceded from wing positions. Could do better. Come on, you get my drift. Pret à Manger, Pret à Porter, Footballers to Buy. Anyway, France v England tonight (and on proper telly) in a friendly, and oh garçon, do they have some good footballers. Looking through their squad there are quite a few who I reckon would look excellent in an Arsenal shirt, and don’t forget, the list does not include Benzema or Martial. Personally, I can’t stand England because of the filth that follow them, so couldn’t care less who wins, but I will watch with my Arsenal eyes glued to the French. Guessing we’ll buy three players this summer, and with one excellent looking signing in the bag already, I would be very happy to select two more from that French lot. Well I’m already standing and I have more hope for the future of our club than I have had in many a long year. The answer is that I want the Arsenal Football Club to be a club that all future generations of supporters can be as proud of as I have been in my seventy years of support. It is my opinion that in order for us to achieve that we need a manager who is honest, successful, and brings us stability along with common sense player decisions that are within our fiscal budget. Arsene Wenger brings all of that in spades and his twenty one seasons have been the most successful in our club’s history. 2016/17 was the only season that Arsene has not got us into a Champions League place – but with sixteen games remaining we were still in a good position to gain our accustomed spot. 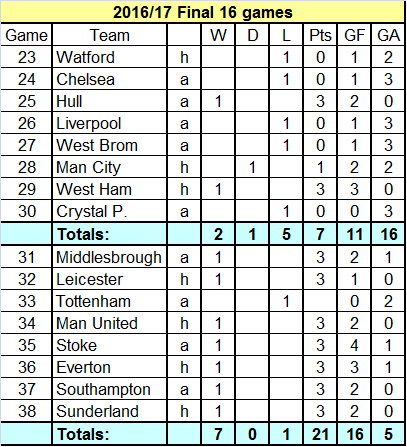 However the next eight games were disastrous causing Arsene Wenger to reconsider his tactics and switch to a back three in defence against Middlesbrough and it turned out to be very successful, as is shown in the chart below, but it proved to be too little too late as we missed our customary CL spot by a single point. Arsenal beat Chelsea 2 -1 while utilizing the same back three system. There have been many periods; some lasting for many years, when I have been disappointed in our lack of success or ambition but my pride in the club has never waned. 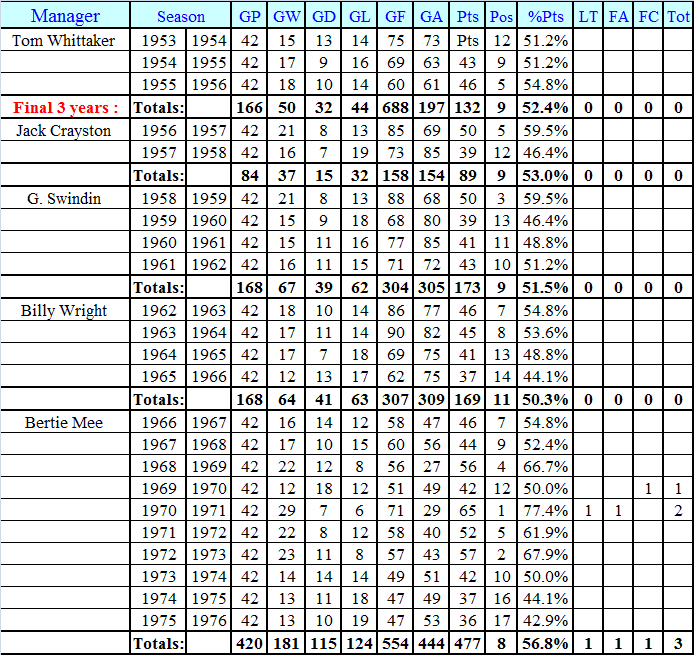 The very worst period that I have personally experienced lasted for thirty three seasons. During this period of thirty three seasons we won one League title, two FA Cups and one Fairs Cup and for the vast majority of the time we started off the season with little or no hope of winning anything. Looking back at these years is a stark reminder of just how bad we were as a team and how much we suffered as fans. Our first double in 1970/71 was, understandably, one of the few seasons when we fans could hold our heads high and we all oozed with pride. Then along came George Graham (1986 to 1995) and he helped to lift our heads up by winning two League titles, one FA Cup, two League Cups and one Cup Winners Cup, ending up with an average league position of 5.11. Unfortunately his demise was one of my lowest moments as an Arsenal supporter when he was fired after being caught accepting illegal payments from an agent whose players were transferred to Arsenal. However the black cloud that it cast over Highbury turned out to have a silver lining as in 1996 Arsene Wenger was hired as our new manager and he quickly turned our frowns into huge grins as we won our second double in 1997 -1998. His record to date has made him the most successful manager in our long history putting him up on the same pedestal as the great Herbert Chapman (1925 – 1934) who won three league titles and one FA Cup and was a trail blazer in introducing multiple new innovations to the game. 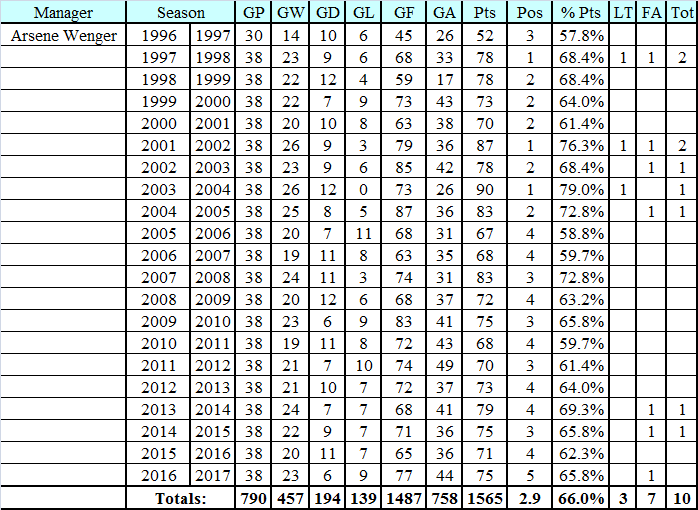 Arsene’s level of consistency over his twenty one seasons with Arsenal is deserving of high credit and the only manager in history to have a better record over such a long period of time is Alex Ferguson. However, that is not a simple comparison as the conditions they managed under were very different. Fergie inherited the Class of 1992 and these young players became the nucleus of the United team that dominated the Premier League; given United’s deep pockets Fergie was able to import some of the World’s top talents to round off his team. Arsene inherited our famous Back Four – they were a top class but aging group of players. Ian Wright was approaching the end of his career while Bergkamp and Patrick Vieira had just joined Arsenal. These players formed the core of Arsenal’s initial team. Arsene, unlike Fergie, has had to work within a strict financial structure that became even tighter with the decision to build a new stadium. With the signing of his latest contract it means that Arsene he will be with us until at least the end of the 2018/19 season. Given that we have to win our way back into a Champions League spot it will mean that Arsene will only have one season in which to win the trophy – if he wins then he will retire – if not I predict that he will extend it for a further two seasons. Champions League Final on the AA sofa. August 2016, and I was sitting next to an Italian chum in a restaurant in Northern Italy. Chum, born Italian and Juventus, has for the past fifteen years lived in North London and become Arsenal as well. The company was good and the conversation flowed merrily. I ask him about Juve’s recent €90M acquisition of Higuain, and he responds quickly and very matter of factly “the loss in the final of 2015 to Barca hurt them badly. They have bought Higuain purely to try and win the Champions League”. Here we are, and tonight they face Real Madrid going for their incredible 12th victory as Champions of Europe. Juve go for their 3rd. I’m very much behind Juve, but of course, look forward to a high scoring entertaining finale to the season. Hopefully an expert or two will join me on the AA sofa tonight and point out a few potential Arsenal targets. I will be eating pizza.